How many stars would you give the last book you read? 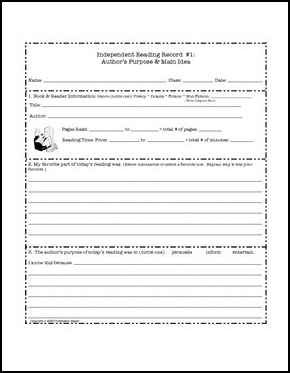 Designed to promote independent reading with an emphasis on Author's Purpose and Main Idea, this document gives students a chance to record their reading progress, difficulties they encountered along the way, and what they did to resolve them. There is also a space for unfamiliar words, and a short reflective writing. 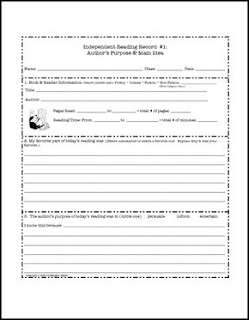 Your students will engage in an analytical and metacognitive activity post reading resulting in a deeper connection to their independent reading materials and a source of data for your records. Note: This handout is two sided. The front pages--with the graphics--are identical (with the exception of the graphics.) This allows you to select the handout with just the right graphic (or graphics--if you'd like your students to have a choice) for your class. The back of the handout is identical. Use the back included with all four of the front pages.